PhoenixAZ1899 wrote: Somebody check my maths, because I'm not good at it. I'm currently sitting at 0.51% in the Tatooine conflict. My rank in the conflict is 330. If my math is right (0.05* X = 330), the total population of accounts playing in the Tatooine conflict is around 65,000. That strikes me as a low number and representative of a far-lower player population than I had anticipated. I get about the same. It's been one more day, so about 70700 people now. That's only 1414 getting a reward. I remember Tat reward for the conflict always used to hover around 3000 people. -> Players are more likely to stay on one planet to try to get into UC rather trying on multiple planets and end up missing UC. Add on to that, the previous 2 Tat conflicts were brutal. Needed 50K points to get into UC. This effectively divided up the players amongst the various planets, and not concentrated on Tat. This isn't a recent change. For the past 4-5 months the tat conflicts have been around 2k for UC instead of 3k, reflecting the overall drop in population. I think by the time the conflict ends, this one will also be around 2k. It's also established fact that the "forces" number shown by each planet is really, really wrong. It never reflects on where a conflict breaks out, doesn't fluctuate from month to month any bigger than a few 100 units, and the "total forces" is a number beyond rational explanation. I'd say your math is right Phoenix, or mine is wrong as well! legofanatikeren Was Here. Leader of Jedi-BladeForce - a training ground for new and experienced younglings alike. Proud officer in The jedi-Family. If I meet you - you better like LEGO! ... No, seriously - you better do. Looks like the curve is flattening out, maybe we are reaching a balance in the force between new recruits and players leaving. Overall chart and a close-up chart is attached. Stigma wrote: Hey is there a way to see SWCs "rate of players"? I'm curious about the official player count rising or declining. Thanks in advance. We will see if that still holds true by 1 October when next KSoD "Shapshot" will be taken. You must do what you think is right, of course. - The Rebel faction has reduced from 73,601 to 72164, a loss of 1,437 commanders. The faction split is now 57:43 in the Empire's favour, as before. This suggests a continued loss at equal rate, but also a significant slow down in the attrition that the game has seen. During the last month, the game has seen a significant update with the introduction of the new Prestige level. It's too early to say if that has had a positive impact or not, but for my part, it's definitely added something to the game and does seem to have increased interest and participation. The conflict rewards for this week were Rancors / Rancor fragments - not a huge incentive as only L10 Prestige commanders can build the Rancor traps. 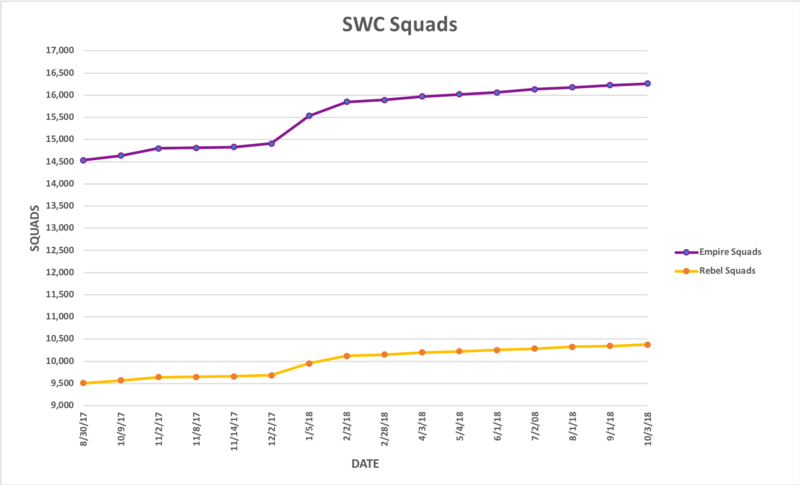 The overall "trend" for the number of Squad per Faction shows a continued slight ⬆ Increase. The overall "trend" for the number of Commanders per Faction shows a continued ⬇ Decrease but at a slower rate than before which is seen as a "positive". 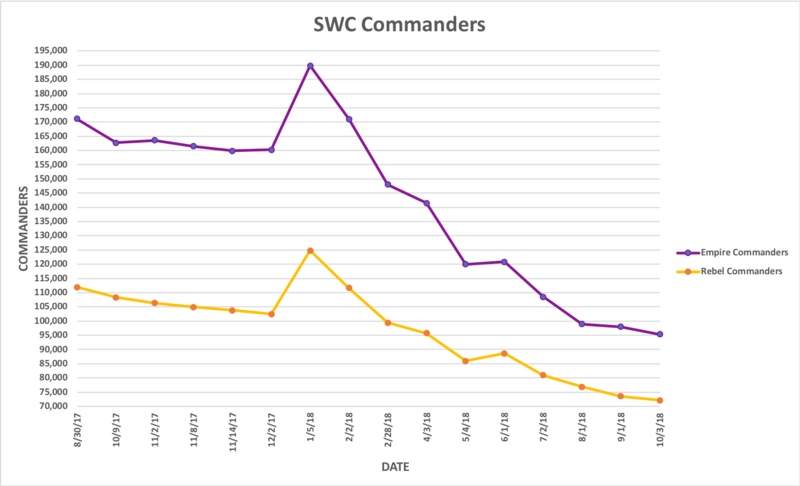 It is a continued hoped that the news of Disney Sells SWC Development To Zynga will reverse the downward trend of Commanders as Zynga starts taking control and releasing game updates. Last edited by DeathStriker on Sat Oct 06, 2018 12:14 pm, edited 1 time in total.